The mustards are my babies. I’m not one for baby talk, I assure you. (My sister might shake her head and remind me of an ill-fated high school relationship, but “babe” will never pass my lips again). I don’t refer to pets as babies—cuteness notwithstanding—and even babies themselves get little more than an indulgent smile, usually for the parent’s benefit. My nano-pet died as many times as it achieved virtual heaven, and the only thing I find irresistibly cute is the Squishable I have asked for the past three Christmases (with no results—I’m looking at you Rae). The mustards aren’t cute in any sense of the word. 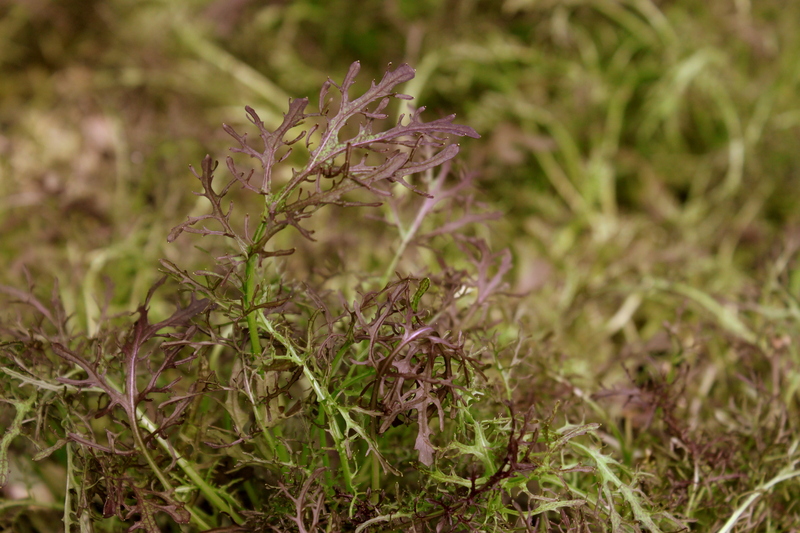 By mustards I mean the mustard greens we grow for the restaurant—Mizuna, Purple Mizuna, Golden Frill, and Red Frizzle—and like babies, they require an enormous amount of attention: several flats of each variety must be sowed weekly, harvested bi-weekly, and watered daily. 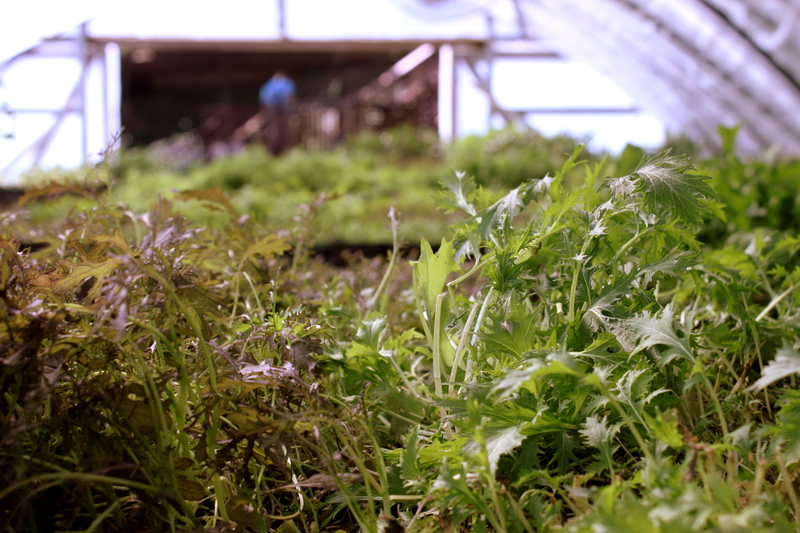 Since it takes roughly a month from sow-date to harvest-ready they span half the greenhouse, a quilt of green and red in various states of maturity. There’s always so much to do in garden that with our ever-increasing task list and rotating schedules it’s rare for one person to see a process through in its entirety. I may pull zucchini from a bed that Christine amends and Ross shapes and Phillip plants out and Adam harvests from, a cycle that can take anywhere from several weeks to several months. 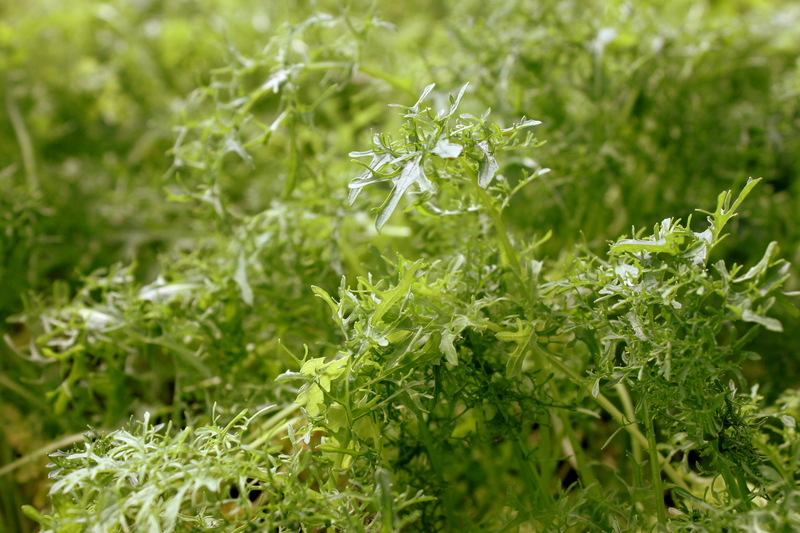 With the mustards, though, it makes more sense for one person to oversee their care and cultivation, so as to gauge how much is needed of each variety and what quantities of sowing and harvesting are necessary to meet the restaurant’s needs. When Ellen left that job fell to me, and within a few weeks I was smitten. How could I not be, watching their little shoots pushing determinedly up from the growers mix or clipping mature, frilly bunches I imagine are my own personal contribution to the restaurant? 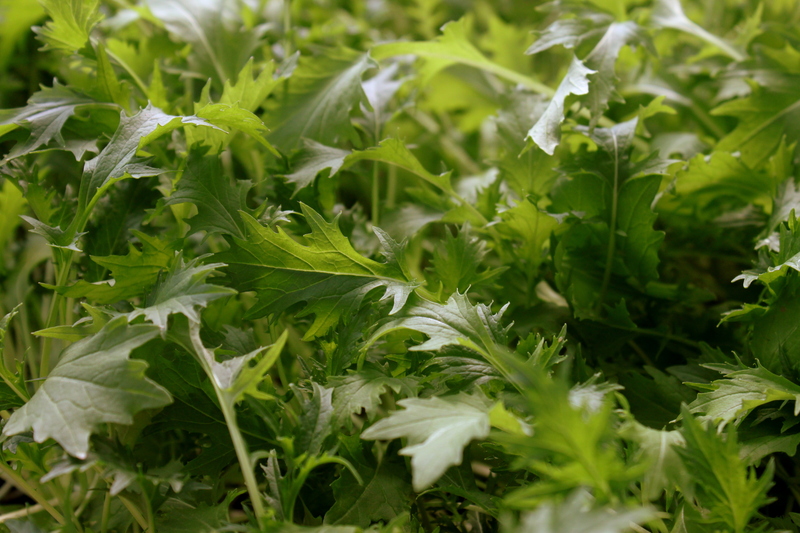 In sowing what I think the restaurant will need in four weeks’ time I do happen to miscalculate (just two bunches of Purple Mizuna this week? Impossible!) and a few weeks ago we had ourselves a mustard glut. 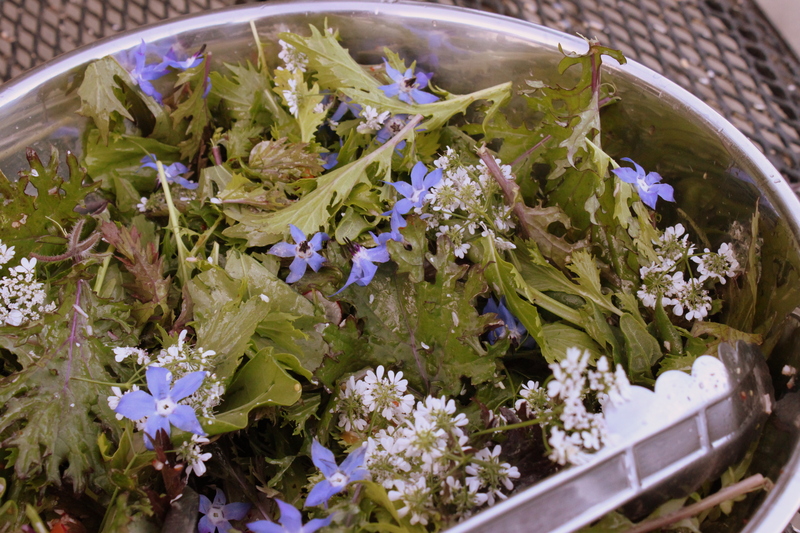 While the restaurant uses them to make the Garden Beignets I wrote about a little while back, they are amazingly good as a simple salad with a great vinaigrette or a light and lemony dressing. I’d never been much good at making dressings (my family has come to expect a last-minute oil-and-balsamic splash on my salads) but I recently learned a trick that makes any dressing deliciously creamy. The key is to make your flavor profile first—the vinegar, mustard, honey, lemon, etc.—then slowly add your oil while whisking constantly. It works every time, and when we gathered for a low-key farm dinner in the gardening classroom one rainy night and I had to make do with what was there, I found that even the simplest ingredients—lemon, honey, pepper, basil and oil—can become something rich and wonderful. In a small bowl whisk lemon juice, basil, honey, pepper, and salt, tasting as you go and adding a bit more of whichever ingredient is needed to reach your desired balance of tart and sweet (dressing making is very much about personal taste and intuition, so it’s actually easier to taste rather than going with exact amounts). When you have the perfect balance, add the oil by pouring into the bowl very slowly with one hand while whisking constantly with the other. Keep up the slow pouring/whisking action until your dressing thickens and looks creamy in texture, then dress your salad and enjoy!